SchoolCity SUITE allows users at all levels to create groups of students for various purposes (e.g., extra support, intervention, challenge). 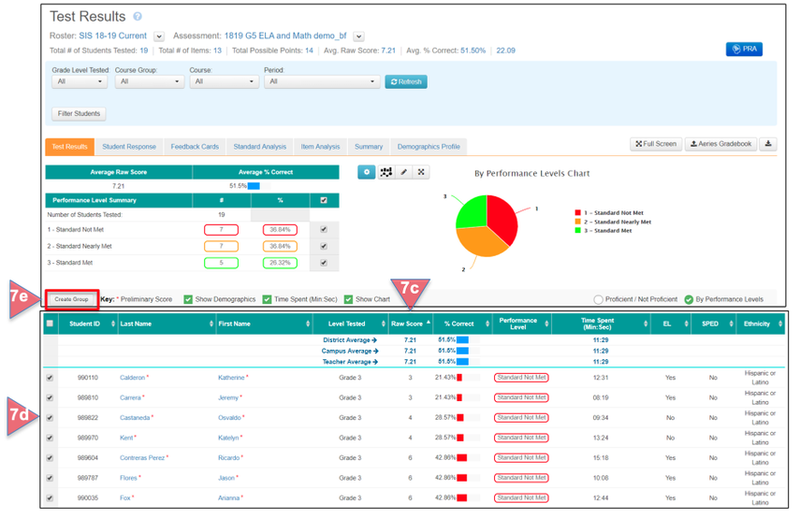 Groups can be created from selected criteria in the Group Manager, from the Class Roster Report, or from a Predefined Report in the Report Manager. This document will review the process for creating a student group. 1. Create a Student Group from the Group Manager: On the SchoolCity SUITE Launchpad, click on the Lines icon on the far right of the Top Menu Bar (1a), then select Groups (1b). 2. Group Manager: This is where you can create new Student Groups and manage your previously created groups. To create a new Student Group, select the Student Group tab (2a), then Select Create Group (2b). 3. Selection Filters: The filters shown will vary according to the District’s Student Information System (SIS). 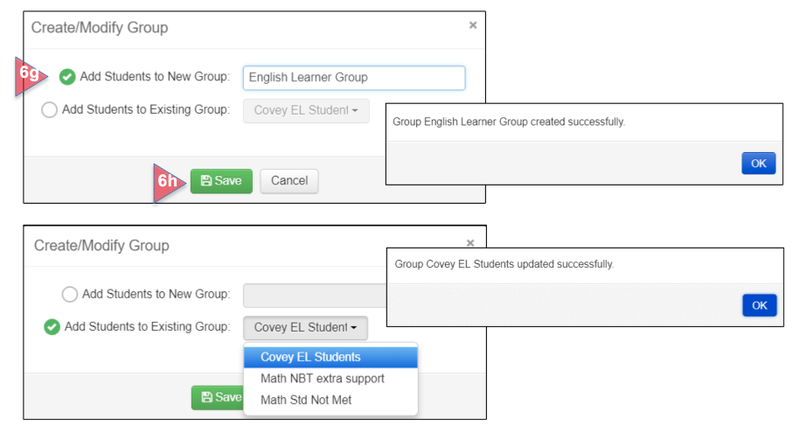 To create a group, use the drop down menus to find the students you want to include in the group. a. Roster search: Use these filters to find the specific roster for a Grade, Course Group, Course, and/or Period. d. Automatically Update: (Default Yes) Select Yes if you do want automatic additions of new students who match the group criteria. Select No if you do not want automatic additions to the group. 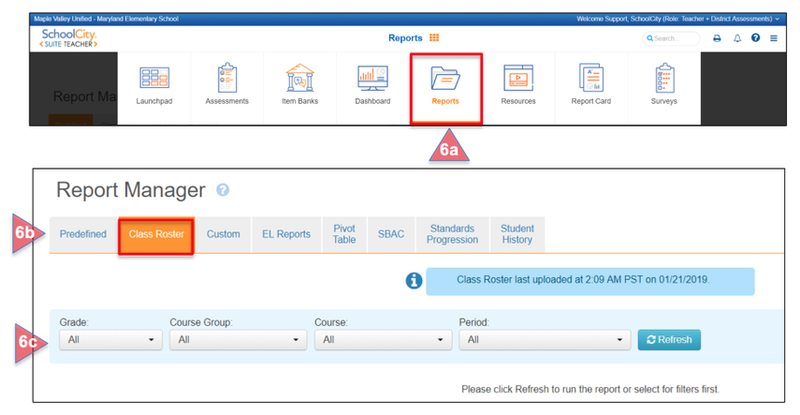 e. Always Run with Roster Data: (Default Yes) Select Yes if you want the roster to determine which student records are available when viewing reports. 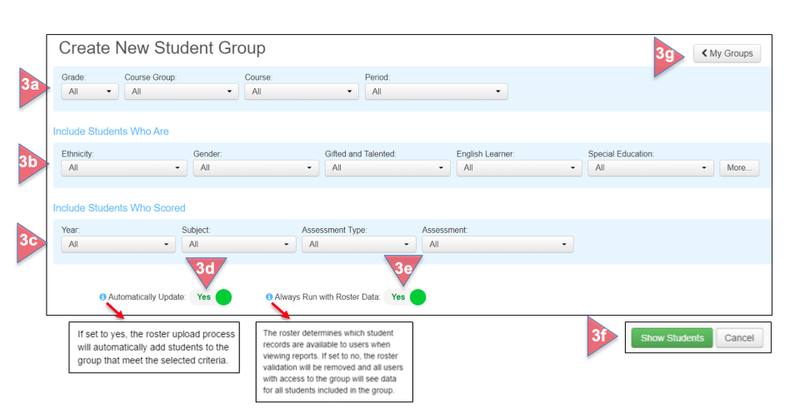 Select No if you want the roster validation to be removed so all users with access to the group can see data for all students in the group. f. Click on Show Students when all criteria have been selected. g. Click on My Groups to return to the Group Manager. a. From the drop down menus, select All or one or more School Years. b. Select All or one or more Subjects. c. Select All or one or more Assessment Types. d. Select All or one or more Assessments. e. Once you have made your initial selections, a table will appear where you can filter more accurately for the specific list of students. Make selections from the drop down menus. f. Select from Performance Bands AND/OR Score Type and Score Range. g. Click on Show Students to view your new group. c. Change Filters: Click here to go back to the filters to select again if these are not the students you want in the group. d. Select Students: Check the box next to each student’s name who should be in the group, or check the box in the header to Select All Records. e. Click Save when all selections have been made. A message will appear confirming the creation of the student group. Click OK to continue. f. My Groups: Click here to return to the Group Manager to view all previously made groups. 6. 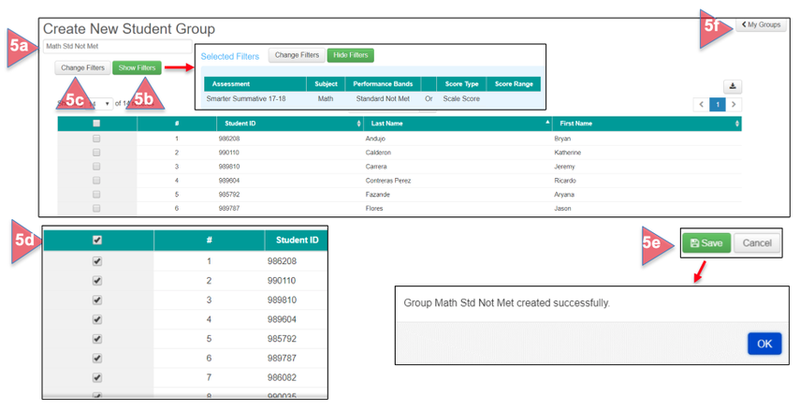 Create a Student Group in the Class Roster Report: Student groups may be created for various purposes in the Class Roster Report. a. Select Reports from the Navigation Grid on the Launchpad. b. Select the Class Roster tab. c. Use the Filters to find the desired class roster. Click Refresh. e. Select students by checking the box next to each student’s name, or check the box in the header to select all students. f. Click on Create Group. g. Add students to a new group and name the group, or add students to an existing group. Click Save when done. h. A message confirming this action will appear. Click OK to continue. 7. Create a Student Group in Predefined Reports: A Student Group can also be made after all students take an assessment and reports are analyzed. Reports with student level data offer the ability to create a group. a. Select Reports in the Navigation Grid on the Launchpad. b. In the Predefined tab, select Test Results by clicking on the name or the View icon (eye). d. Select students by clicking on the box next to the student ID, or select all students by clicking on the box in the header. e. Click on Create Group. f. Add students to a new group and name the group, or add students to an existing group. Click Save when done. g. A message confirming this action will appear. Click OK to continue. Please refer to the Help documents, Groups: Creating Course Groups and Managing Student and Course Groups, for more information.